It's not just any Cinco de Mayo party - it's a Mexican lotería card party. How 'bout dat? Not familiar with Mexican lotería cards, you say? Well, how lucky for you that I'm in your life to impart such fun and mostly useless knowledge. Lotería is a traditional Mexican game (very similar to bingo) that's played with a deck of 54 cards and a grid (tabla for those that habla) - but instead of calling out the number/letter combo in a lunch lady voice a-la Americana way (why we always so refined? ), the announcer says a riddle to indicate which card has been selected. Apparently these riddles are most entertaining part of the game ("since poetic license is afforded to the announcer of lotería, the success and popularity of the announcer depend on his cleverness and style"). The player who fills up their grid first is the winner-winner-chicken-dinner. 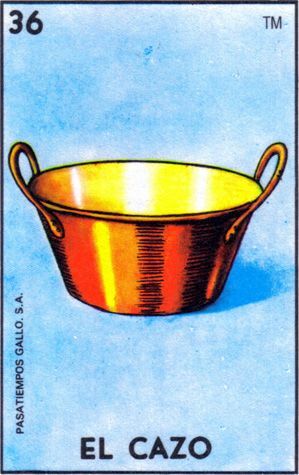 The images on each card (examples below) are iconic in Mexican culture - so when I heard that some party prodigy out there is throwing a Cinco de Mayo shindig and has assigned each guest a lotería card to dress up as, I fuh-reaked out (to put it mildly). A few (~50 or so) links later, I overdid with outfit options for a fab San Antonio friend who had been dealt the palm tree card. 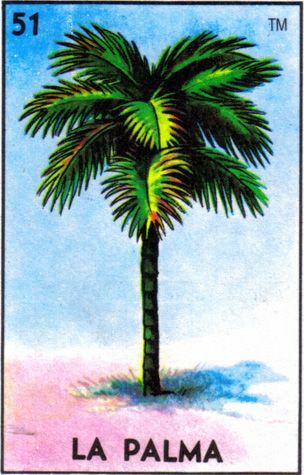 With all the incredible palm-pieces circling around the online retail merry-go-round lately (see some looks below), I think being #blessed with La Palma card means you've already won the lottery. Best of luck to the invitee who got the El Cazo card (literal translation - the saucepan), and someone (anyone!) please throw a lotería party and invite me.